Hello! The first snow flakes arrived this week and they’re already gone by now. Too bad cause I love a winter white environment on my photos! It always looks so bright and neutral. I hope the real winter still has to come, can’t wait for an overdose of snow! YAY! 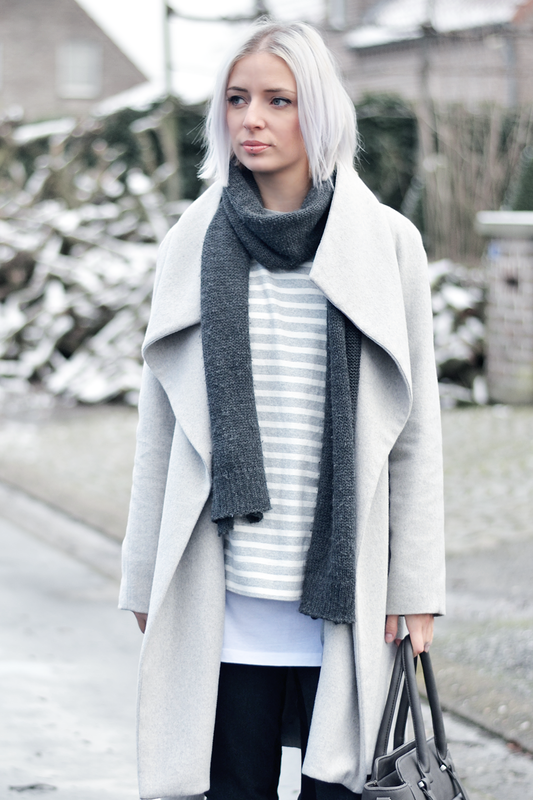 Today I’m wearing a monochrome outfit, by chance I mixed a couple of grey items together. I didn’t noticed it until I saw the photos on my laptop! Probably because there’s still a contrast of bright and dark grey and some added stripes. It’s actually kind of interesting how variated an outfit in one color can be! Mooie outfit! Leuk met die verschillende tinten grijs! Wauw, hele mooie look, staat je goed! That outfit is gorgeous babe!